Before entering any new international market, it is essential to make informed decisions based on knowledge, research and strategic planning. DIT North West offer fully-funded impartial advice through their team of Trade and e-Commerce Advisers to nurture your international ambitions. DIT can assist exporters of all levels of experience through advice, mentoring and strategic planning to ensure your business has all the necessary knowledge to capitalise on overseas opportunities. DIT have a programme of workshops for potential exporters, designed to highlight opportunities, address concerns and guide you through the initial steps into new markets. DIT’s Global Growth Service enables ambitious businesses to grow their existing exports. With a structured package of support, tailored to specific business needs, they will help you realise your global potential. With an annual calendar of events, seminars, masterclasses and overseas visits, DIT enable local companies to gain all the necessary knowledge and skills to take advantage of overseas opportunities. DIT’s face-to-face and desk-based market research services deliver bespoke and tailored insights into which countries may provide the best opportunities for your business. DIT’s embassy-based trade experts source all the latest export leads, many of which are exclusive so that you can grab global opportunities ahead of your competition. Together with their colleagues across the north of England, DIT deliver a number of Northern Powerhouse led business visits to overseas markets and key exhibitions throughout the year. The “Find a Buyer” service offers clients an opportunity to showcase product lines or services to an international audience. Reach over two billion consumers online around the world through the “Selling online overseas” service. Have you considered exporting your company’s goods or services to international markets but are not sure where to start? Or do you already export products or services overseas but want to do more? If the answer to either of these questions is yes, then the UK Government is here to inspire you, advise you and help you on your exporting journey. UK Government can provide you with the tools you need to export, for example financial support, funding for overseas trade shows and details of potential buyers overseas. And has access to one of the largest global networks of any trade promotion organisation. Their 1,200 dedicated staff in 109 countries worldwide are a world class resource for businesses in Wales. 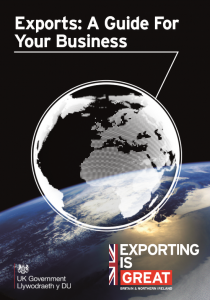 Exports: A Guide for your Business, is a free downloadable brochure that provides details of the support offered by the UK Government as well as examples of companies that have worked with them to become successful exporters. There has never been a better time for companies in Wales to export their products and services to new markets. “I genuinely hope your company can join the thousands of other businesses in Wales that are already exporting. I am sure that this material will help you do that by providing you with confidence and convincing you that Exporting is GREAT.” – Alun Cairns, Secretary of State for Wales. Trading abroad can boost your profile, credibility and bottom line. Visit the Great.Gov website for straightforward guidance on how to start selling outside the UK. The Great.Gov website also has useful information for experienced exporters who are looking to expand into further overseas markets. Visit the Exporting is Great website for Export Opportunities; Find and apply for overseas opportunities from businesses looking for products or services like yours. You can also sign up for the Department for International Trade’s free alert service. Visit Export.Great.Gov to create your business profile and get seen by motivated overseas buyers to generate international sales leads. Show off your company’s experience and outstanding projects to give potential buyers more insight. And see relevant government-supported export development events where overseas buyers will be attending.